Greetings! The 88 Project was founded five years ago, on November 24, 2012. Please read our Letter of appeal and support us in our work. Onto the news, analysis, and actions regarding human rights and civil society in Vietnam during the week of November 20-26. Mother Mushroom’s appeal trial is set for November 30. She has lost one of her lawyers, Vo An Don, after he was disbarred just days before the trial. Authorities have announced that video bloggers Vu Quang Thuan and Nguyen Van Dien will be prosecuted under Article 88, facing up to 12 years in prison. Activists were harassed after a meeting with EU delegates this week, mirroring an incident last week in which three activists were detained also following a meeting with EU representatives. Read two eye-opening pieces, one investigating the different types of blogging in Vietnam, and one outlining labor abuses of female workers at a Samsung plant, in the analysis section. We remember blogger and entrepreneur Tran Huynh Duy Thuc as his birthday, November 29, is approaching. Please take action for Mother Mushroom ahead of her appeal trial. Imprisoned blogger Nguyen Ngoc Nhu Quynh, a.k.a. Me Nam, will face an appeal trial on November 30in Nha Trang. She was sentenced to ten years in prison in June 2017. In prison, Quynh’s health is still of great concern. Quynh’s mother, Ms. Nguyen Tuyet Lan, visited her on October 23 and shared on Facebook that Quynh was in poor health. For the Day of the Imprisoned Writer, Madeleine Thien, of Canada, wrote a letter to Quynh for PEN International: “You wrote about the struggles of others, and you advocated for the release of political prisoners, and for this, your freedom was taken away.” Read the full letter, here. Neither Vietnam nor any Southeast Asian nation supported the UN Resolution on the Safety of Journalists and the Issue of Impunity this week. Police have finished the investigations of Vu Quang Thuan (right) and Nguyen Van Dien (left), who have been in pre-trial detention since their arrests on March 3, 2017 for “making and distributing video clips with bad content on the Internet.” They will be prosecuted under Art. 88 cl.1 and face up to 12 years in prison. Just days before their arrest, they uploaded a video series called “Guide to Lawful Protest.” They are leading members of the Vietnam Progressive Movement and have been watched by the state for many years; read more on their backgrounds here. Lawyer Ha Huy Son, Nguyen Van Dien’s defense counsel, met with Dien for the first time on November 24 in Detention center No. 1 in Hanoi, and shared that Dien is in good health and spirit. 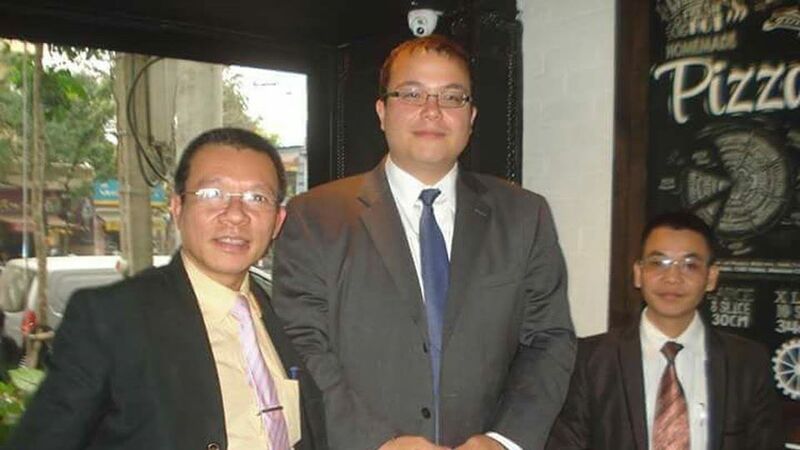 Less than a week after three activists were detained following a meeting with EU delegates, on November 21, Vietnamese civil society activists were watched and intimidated following another series of meetings with foreign representatives to discuss the on-the-ground human rights situation in Vietnam. At this meeting were former prisoners of conscience, including Bui Thi Minh Hang, who was among the three detained last week by authorities; Ms. Trang, prisoner of conscience Pham Van Troi’s wife; and several other human rights campaigners. November 29 is Tran Huynh Duy Thuc‘s birthday. It is the ninth birthday he has spent in prison since his arrest in May 2009. An entrepreneur and social and political blogger, he was sentenced to sixteen years in prison on January 20, 2010 — one of the longest sentences for a current prisoner of conscience in Vietnam. In 2014, we released a video about Thuc with a message from his father in honor of his birthday. Thuc’s family and many followers remain committed to his release, despite pressure from authorities. Take PEN International’s action for Nguyen Ngoc Nhu Quynh (Me Nam), calling for her immediate release ahead of her appeal trial on November 30.